Discount tickets for the 2016 season offered by the Douglasville Welcome Center, are now available! Get your discounted tickets to Six Flags Over Georgia, a 100-acre park with awesome rides, great shows, and incredible attractions! The Douglasville Welcome Center, located at 6994 East Broad Street in downtown Douglasville, has discounted one-day admission Six Flags tickets as well as a limited supply of 2 park season passes to Six Flags & White Water, with parking included available for purchase. Tickets can only be purchased with cash or checks; credit or debit cards are not accepted. Call 770-947-5920 for more information. Summer is in full swing! 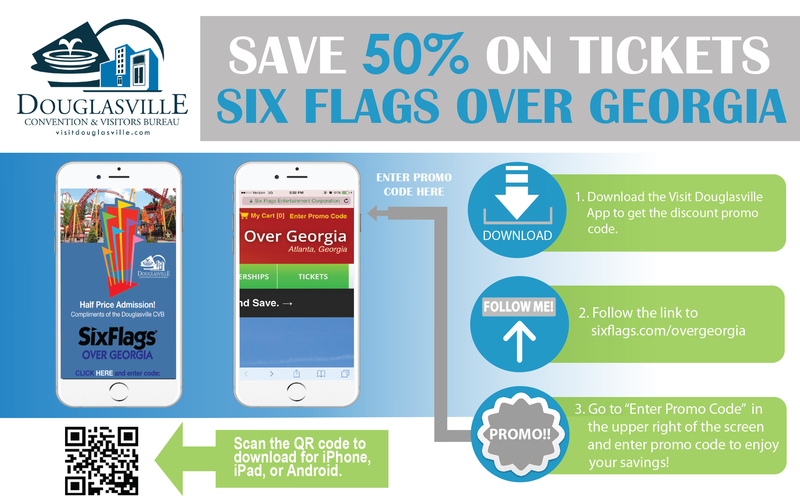 Before your next trip to Six Flags, be sure to download the Visit Douglasville mobile app to save 50% off the price of a general admission ticket! Not only is the Visit Douglasville mobile app great for discounts, it also has information on dining, shopping, and a link to a full events calendar to stay up to date on everything going on in the Douglasville and Douglas County area! Simply scan the QR code below to get started! In addition to the great savings provided by our Visit Douglasville mobile app, we also have discounted 2 park season passes to Six Flags Over Georgia and Six Flags White Water! (Quantities are limited.) The 2 park season passes can be purchased Monday – Friday 8:00AM – 5:00PM, by stopping in the Douglasville Welcome Center at 6694 East Broad Street, Douglasville, GA 30134. Tickets can only be purchased with cash or checks; credit or debit cards are not accepted. Call 770-947-5920 for more information.